• High sensitivity and wide detection range: detection of as little of 1.6 pmoles of phosphate and useful range between 0.02 μM and 40 μM phosphate. • Fast and convenient: homogeneous "mix-and-measure" assay allows quantitation of free phosphate within 20 minutes. • Robust and amenable to HTS: Z factors of 0.7 to 0.9 are observed in 96-well and 384-well plates. Can be readily automated on HTS liquid handling systems. • The Malachite Green Phosphate Assay Kit is based on quantification of the green complex formed between Malachite Green, molybdate and free orthophosphate. The rapid color formation from the reaction can be conveniently measured on a spectrophotometer (600 - 660 nm) or on a plate reader. The non-radioactive colorimetric assay kits have been optimized to offer superior sensitivity and prolonged shelf life. 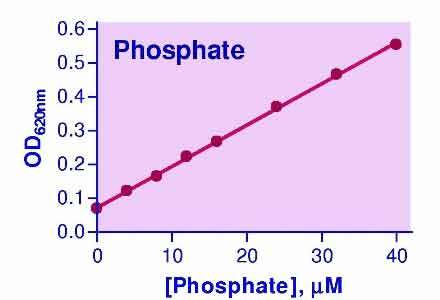 The assay is simple and fast, involving a single addition step for phosphate determination. Assays can be executed in tubes, cuvettes or multi-well plates. The assays can be conveniently performed in 96- and 384-well plates for high-throughput screening of enzyme inhibitors. 1. Green, ML et al (2005). Ethylene glycol induces hyperoxaluria without metabolic acidosis in rats. Am J Physiol Renal Physiol 289: F536–F543. Assay: Phosphate in Human enzyme (Pubmed). 2. Saran, D et al (2006). Multiple-turnover thio-ATP hydrolase and phospho-enzyme intermediate formation activities catalyzed by an RNA enzyme. Nucleic Acids Res. 34(11): 3201–3208. Assay: Phosphate in Human Phosphotyrosyl phosphatase activator (Pubmed). 3. Guo W et al (2006). The bioreduction of a series of benzoquinone ansamycins by NAD(P)H:quinone oxidoreductase 1 to more potent heat shock protein 90 inhibitors, the hydroquinone ansamycins. Mol Pharmacol. 70(4):1194-203. Assay: Phosphate in Yeast Sac enzymes (Pubmed). 4. Chao Y et al (2006). Structure and mechanism of the phosphotyrosyl phosphatase activator. Mol Cell. 23(4):535-46. Assay: Phosphate in Bacteria enzyme (Pubmed). 5. Adkins, M.W et al (2007). Chromatin Disassembly from the PHO5 Promoter Is Essential for the Recruitment of the General Transcription Machinery and Coactivators. Mol. Cell. Biol. 27: 6372–6382. Assay: Phosphate in Bacteria nucleotide hydrolysis (Pubmed). 6. Guérette D et al (2007). Molecular evolution of type VI intermediate filament proteins. BMC Evolutionary Biology 7:164. Assay: Phosphate in Bacteria GTP hydrolysis (Pubmed). 7. Yoshida C et al (2010). Analysis of inhibition of topoisomerase IIalpha and cancer cell proliferation by ingenolEZ. Cancer Sci. 101(2):374-8. Assay: Phosphate in Bacteria DNA hydrolysis (S. thermophilus) (Pubmed). 8. Kim HE et al (2005). Formation of apoptosome is initiated by cytochrome c-induced dATP hydrolysis and subsequent nucleotide exchange on Apaf-1. PNAS 102(49):17545-50. Assay: Phosphate in Human Hsp90 (Pubmed). 9. Blumental-Perry A et al (2006). Phosphatidylinositol 4-phosphate formation at ER exit sites regulates ER export. Dev Cell. 11(5):671-82. Assay: Phosphate in Human enzyme (Pubmed). 10. Koroleva O et al (2007). Structural conservation of RecF and Rad50: implications for DNA recognition and RecF function. EMBO J. 26(3):867-77. Assay: Phosphate in Yeast medium (Pubmed). 11. Anand SP et al (2007). DNA helicase activity of PcrA is not required for the displacement of RecA protein from DNA or inhibition of RecA-mediated strand exchange. J Bacteriol. 189(12):4502-9. Assay: Phosphate in Human cell lysate, PP2A (Pubmed). 12. Cha C et al (2011). Integrative design of a poly(ethylene glycol)-poly(propylene glycol)-alginate hydrogel to control three dimensional biomineralization. Biomaterials.32(11):2695-703. Assay: Phosphate in Bacteria enzyme (Pubmed). 13. Sinkunas T et al (2011). Cas3 is a single-stranded DNA nuclease and ATP-dependent helicase in the CRISPR/Cas immune system. EMBO J. 30(7):1335-42. Assay: Phosphate in Mouse enzyme extract (Pubmed). 14. inhibition. Cancer Res. 65(21):10006-15. Assay: Phosphate in Yeast purified ATPase (Pubmed). 15. Blumental-Perry A et al (2006). Phosphatidylinositol 4-phosphate formation at ER exit sites regulates ER export. Dev Cell. 11(5):671-82. Assay: Phosphate in Bacteria enzyme (Pubmed). 16. Lu B et al (2007). Roles for the human ATP-dependent Lon protease in mitochondrial DNA maintenance. J Biol Chem. 282(24):17363-74. Assay: Phosphate in Human ATPase, GTPase (Pubmed). 17. Barisic S et al (2008). Identification of PP2A as a crucial regulator of the NF-kappaB feedback loop: its inhibition by UVB turns NF-kappaB into a pro-apoptotic factor. Cell Death Differ. 15(11):1681-90. Assay: Phosphate in Mouse tissue (Pubmed). 18. Ramamurthi KS, Losick R (2008). ATP-driven self-assembly of a morphogenetic protein in Bacillus subtilis. Mol Cell. 31(3):406-14. Assay: Phosphate in Bacteria ATPase, GTPase (Pubmed). 19. Guilfoyle A et al (2009). Structural basis of GDP release and gating in G protein coupled Fe2+ transport. EMBO J. 28(17):2677-85. Assay: Phosphate in Human topoisomerase (Pubmed). 20. Li Q, Uitto J (2010). The mineralization phenotype in Abcc6 ( -/- ) mice is affected by Ggcx gene deficiency and genetic background--a model for pseudoxanthoma elasticum. J Mol Med (Berl). 88(2):173-81. Assay: Phosphate in N/A hydrogels (Pubmed). 21. Hsieh CW et al (2010). Direct MinE-membrane interaction contributes to the proper localization of MinDE in E. coli. Mol Microbiol. 75(2):499-512. Assay: Phosphate in Human Hsp90 (Pubmed). 22. Lin J, Wilson MA (2011). Escherichia coli thioredoxin-like protein YbbN contains an atypical tetratricopeptide repeat motif and is a negative regulator of GroEL. J. Biol Chem. 286(22):19459-69. Assay: Phosphate in Plant extracts (Pubmed). 23. Hu, M et al (2010). Effect of prolonged starvation on body weight and blood-chemistry in two horseshoe crab species: Tachypleus tridentatus and Carcinoscorpius rotundicauda (Chelicerata: Xiphosura). J. Exp. Marine Biol. Ecology 395(1-2):112-119. Assay: Phosphate in Rat urine, serum (Pubmed). 24. Guo W et al (2005). Formation of 17-allylamino-demethoxygeldanamycin (17-AAG) hydroquinone by NAD(P)H:quinone oxidoreductase 1: role of 17-AAG hydroquinone in heat shock protein 90. Assay: Phosphate in Human RNA (Pubmed). 25. Reigan P et al (2011). A mechanistic and structural analysis of the inhibition of the 90-kDa heat shock protein by the benzoquinone and hydroquinone ansamycins. Mol Pharmacol. 79(5):823-32. Assay: Phosphate in Human cell (Pubmed). 26. Soni V et al (2015). Depletion of M. tuberculosis GlmU from infected murine lungs effects the clearance of the pathogen. PLoS Pathog 11(10):e1005235. Assay: Phosphate in Bacteria enzyme (Pubmed).